This is the latest addition from Carron Stoves with an output of 4.7kW, meaning that it doesn't require a room vent. One of our favourite stoves is the multi fuel Carron stove, the red enamel stoves being the most popular of the range. With a large glass window and traditional looks, the Carron stoves are suitable for burning all solid fuels. It has a primary and secondary air intakes built into the door. 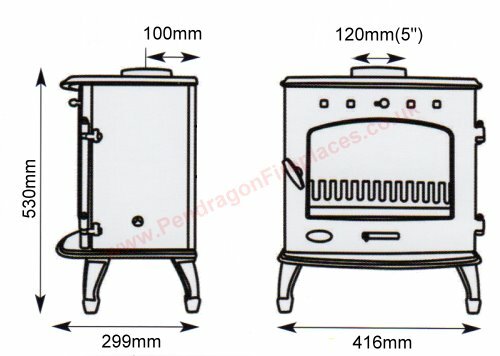 Overall a great stove at an affordable price, highly recommended. View video of stove in operation. Don't forget to order stove pipe when ordering your stove. If your chimney leaks and requires a liner, order flue liner now.